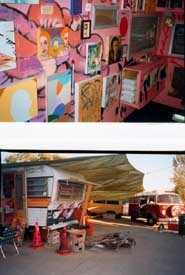 a salon style painting show to be held in and outside of the Urban Disco Trailer. The exhibition will open for one evening only on August 23rd in the parking lot at 101 Niagara. Alchemy and Mysticism #2 will open in conjunction with the Fall issue launch of Hive Magazine. Alchemy & Mysticism #2 -- a particular mix of things.